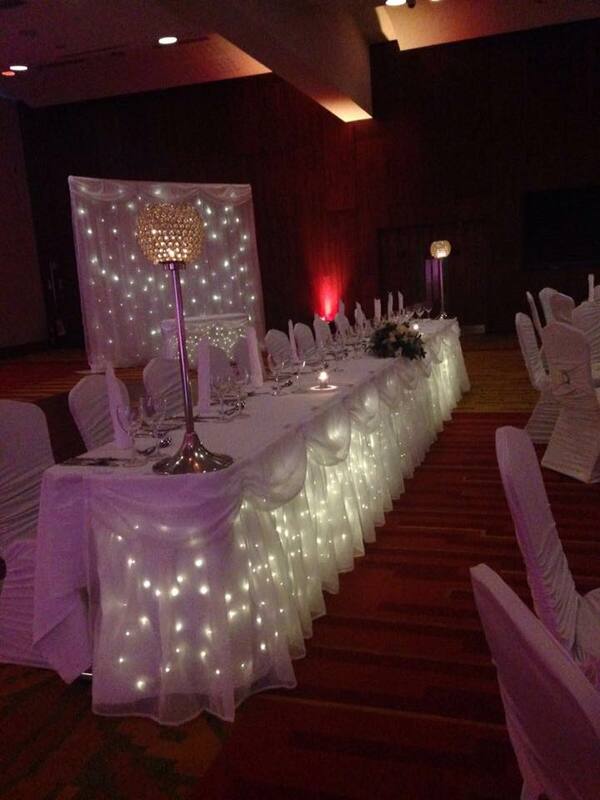 Our top table backdrop is the perfect setting for your big day. We have the option of snow white, ivory or black in colour. The standard size can go up to 20ft high and 24ft wide. 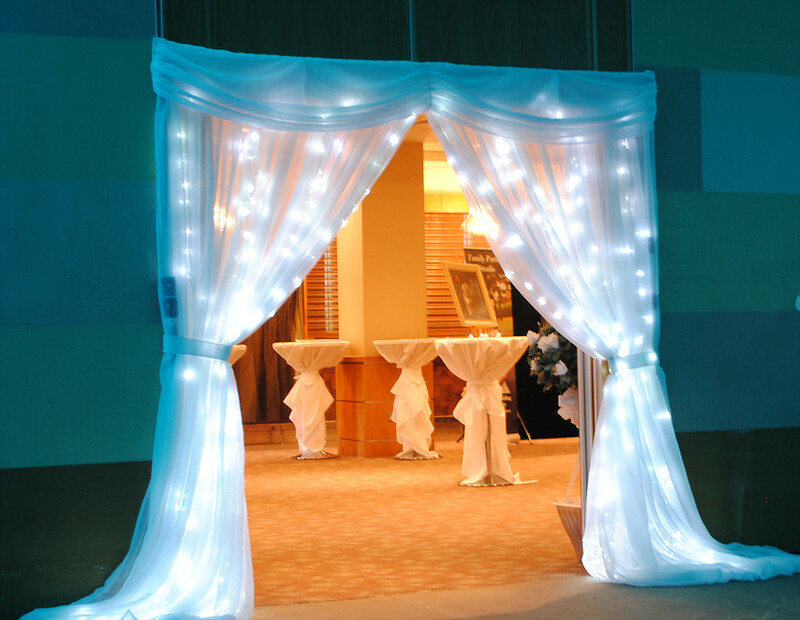 We have large numbers in stock if you wish to add to the width we can custom build to your venue. A wedding day is filled with love, laughter and memorable moments such as cutting of the cake. Our fairy light cake backdrop gives a beautiful background for this memory and makes the cake a centrepiece in the room. It can be 8ft/10ft high and 10ft wide usually, again we can custom build this to fit your venue. Colour options again would be snow white, ivory or black. This fairy light door treatment give’s you that magical entrance to your function room. It is snow white and has multiple light settings to get some wonderful photos in front of. This skirt dresses your top table with beauty and sparkle to create an emphasis on where yous are sitting. It is attached tot he front of the table and can be positioned on a straight or rounded top table. This also has numerous settings of lights. This skirt dresses your cake table drawing your attention towards it such as the cake back drop mentioned above . It is attached to the front of the table and can be positioned on a straight or rounded table like the top table skirt so you have options for your layout. This also has numerous settings of lights. 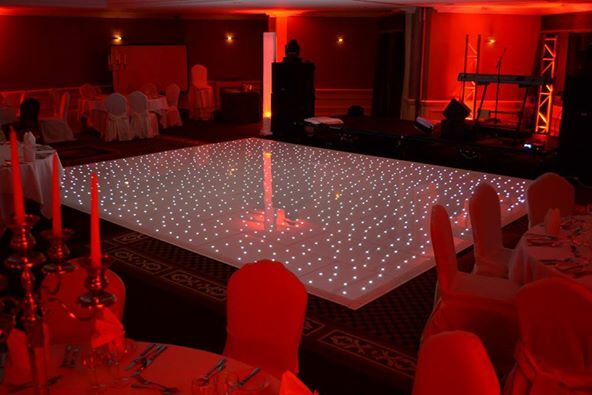 Our fairy light dancefloor creates a fantastic focal point on your day and adds the wow factor for the evening entertainment. The fairy light dance floor is a sure way to dazzle your guest’s and ensure you dance the night away with added sparkle.